Her sons are physically disabled. She is partially blind. . To top it all, the Pension Schemes stopped. 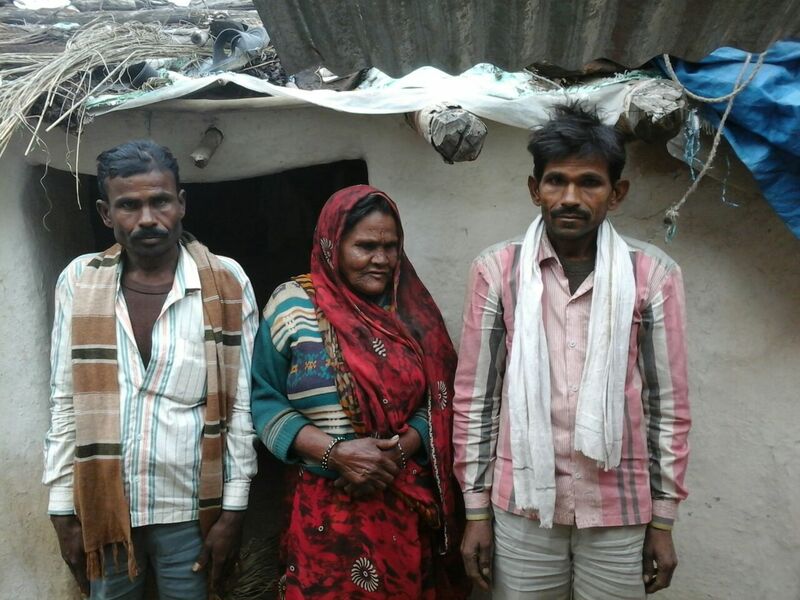 Soochna Seva restores hope to a family whose life almost came to a standstill. Daulata Bai Sahu is a 68-year-old widow from Dehrikilla village in Aron block, Guna district. Her husband passed away thirty years ago and after his death she was left with two sons, Amar Singh Sahoo (32) and Pran Singh Sahoo (28). They are auditory and visually impaired since childhood. In 2013, Daulata Devi applied for Vridha Pension Scheme and her sons enrolled for Viklang Pension Scheme. As they are daily wage labourers, pension from these schemes resolved their miseries to a larger extent. Unfortunately, the pension stopped all of a sudden without any prior notice in September 2014. This gridlock disturbed their lives and their struggle for existence continued for many months. Their wait came to an end when the Soochna Seva team met the family during a door- to- door visit in Dehrikilla village. When the team at SSK heard about Daulata Bai Sahoo’s woes, they went to Aron Panchayat on January 5, 2015. The officials at the Panchayat office directed them to go to the bank about the status of the pension schemes that the family was enrolled in. On January 8, 2015 the Soochna Seva team visited Madhyanchal Gramin Bank in Rampur, Aron block, to gather more details. The officials at bank notified the Soochna Seva team to provide required documents such as the Death certificate of Daulata Bai’s husband, Aadhar card and Certificate of Disability, to initiate the pension plan once again. On January 10, 2015, Soochna Seva along with Daulata Bai Sahoo approached the Panchayat and the Village Development Officer (VDO) signed the forms provided by the bank. To obtain the Certificate of Disability they went to the government hospital.